Lawrence Francis Glaser, age 87, resident of Ponca City, passed away December 29, 2017, in Ponca City. A wake will be held Wednesday, January 3 at 6:00pm at the Trout Funeral Home chapel in Ponca City. A Mass of Christian Burial will be held Thursday, January 4 at 10:00am at St. Mary’s Catholic Church, with Father Carson Krittenbrink officiating. Following the Mass, he will be laid to rest at Resthaven Memorial Park. 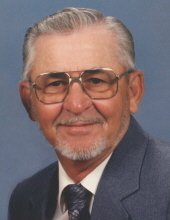 Lawrence was born on April 26, 1930 to Frank and Mary Glaser in Ponca City. He worked at Continental Oil Company until his retirement. Throughout his life, Lawrence was devoted to his beloved wife, Donna. The loving couple celebrated 68 years of marriage this past summer. Lawrence was interested in hunting, fishing, trapping, and working on his farm. He enjoyed raising chickens and sheep. His garden was a passion that he shared with Donna. Lawrence was known for frequently gifting wonderful fruits and vegetables. He attended St. Mary’s School for twelve years. He was a lifelong member of St. Mary’s Catholic Church and often served as an usher at the church. Survivors include his beloved wife, Donna Glaser, his 4 children, Trudy Glaser Lefrak, Tim Glaser, Tracy Glaser, and Mark Glaser. He is also survived by his 14 grandchildren, 24 great-grandchildren, and 3 great great-grandchildren. Lawrence was preceded in death by his parents, Frank and Mary Glaser, and his siblings, Bernadine, Louise, Louella, and Charles, as well as his son, Michael Glaser. Casketbearers will be Matt Glaser, Stephen Glaser, Dustin Glaser, Chris Glaser, Joshua Glaser, and Tony Schieber. Memorial contributions may be made to St. Mary’s School, 415 S 7th St, Ponca City, OK 74601.